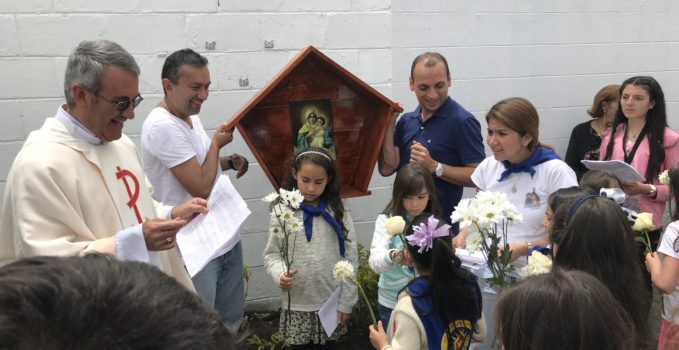 Schoenstatt has burst forth in the Colombian capital, and the Blessed Mother has arrived to stay. 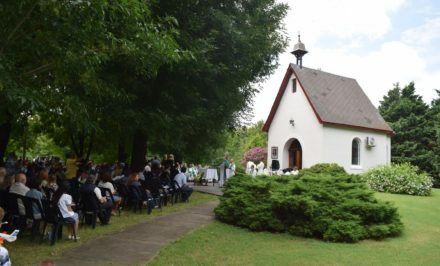 Led by the Girls’ Youth, the Schoenstatt Family gathered and built the first wayside shrine for the Blessed Mother. They consecrated her in a house garden located in the Niza neighborhood. From this small place, the emerging youth have given Colombians a place of welcome so that our Queen can conquer more and more hearts. 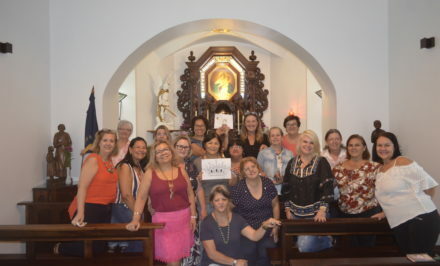 Approximately seventy people participated on that great day, Saturday, 26 May, during Mary’s Month, to celebrate the Queen and give her a place outdoors; asking her with this for the grace of making the youth grow. 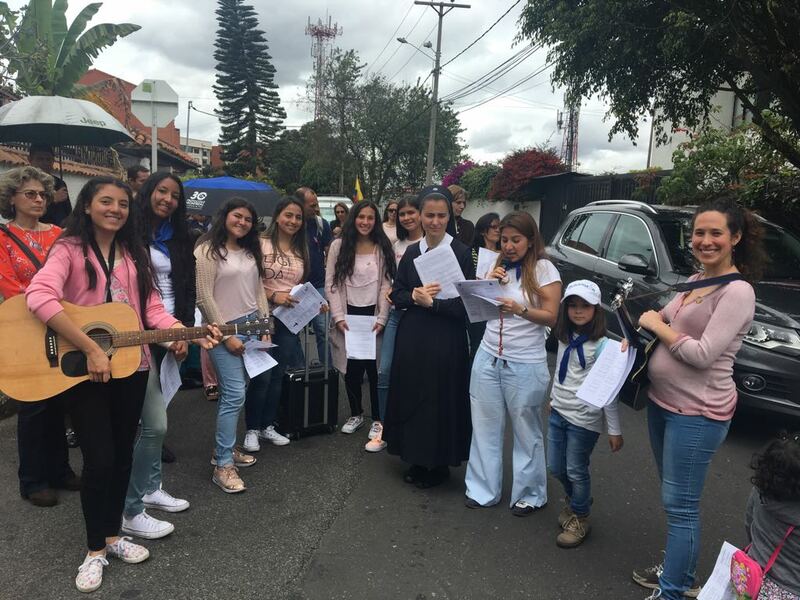 In addition, they united in prayer for the Colombian presidential elections that would be the following day…an historic day for the Schoenstatt Movement in Bogotá. 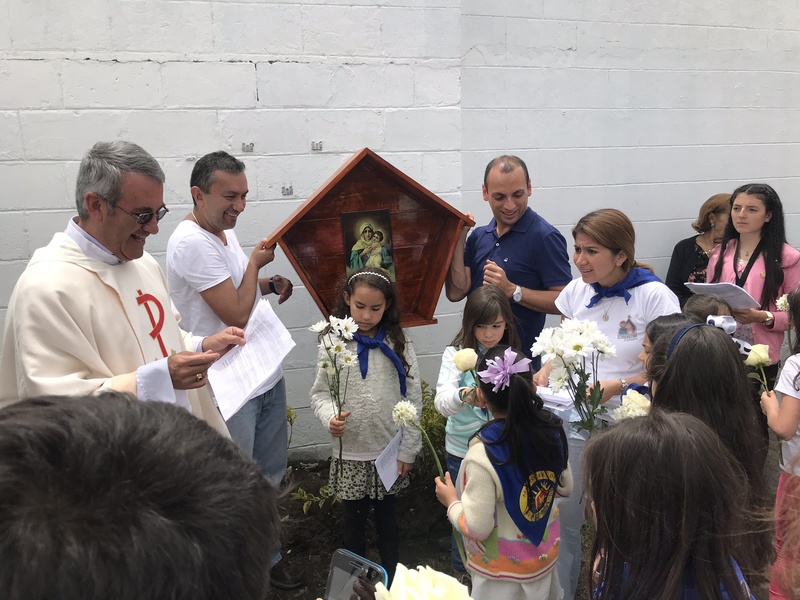 As the sun flooded every corner of the city, at 10:00 am, the gathering started with a procession through neighborhood streets led by the picture of the Blessed Mother that would be blessed, carried by two members of the Family Branch, parents of the Girls’ Youth. Children and youths from St. Maximilian Kolbe Parish and the Blessed Mother’s House (two places where they are currently forming youth groups), proudly carrying their flags and group symbols of Squires, Apostles of Mary and Schoenstatt Allies, escorted the Queen. The procession continued with members of the Family Branch, some women and Pilgrim Mother missionaries, along with neighbors who joined to honor the Blessed Mother. Curiosity was generated among the passersby and neighborhood residents, who were puzzled upon observing this group from their windows parading through the streets carrying a picture of Mary on their shoulders, escorted by the police and two cars. A Rosary was prayed during the procession, reflecting on the words of Fr. 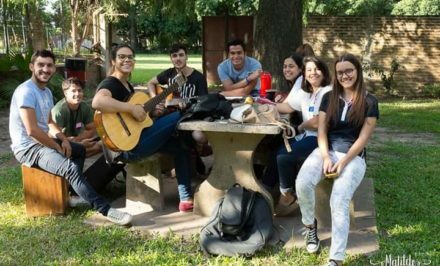 Kentenich, and at the beginning of every mystery, a special intention was offered with an emphasis on the election for the next Colombian president and the need to grow as Schoenstatt youth. They sought to generate a moment of silence for personal reflection, for listening and prayer. 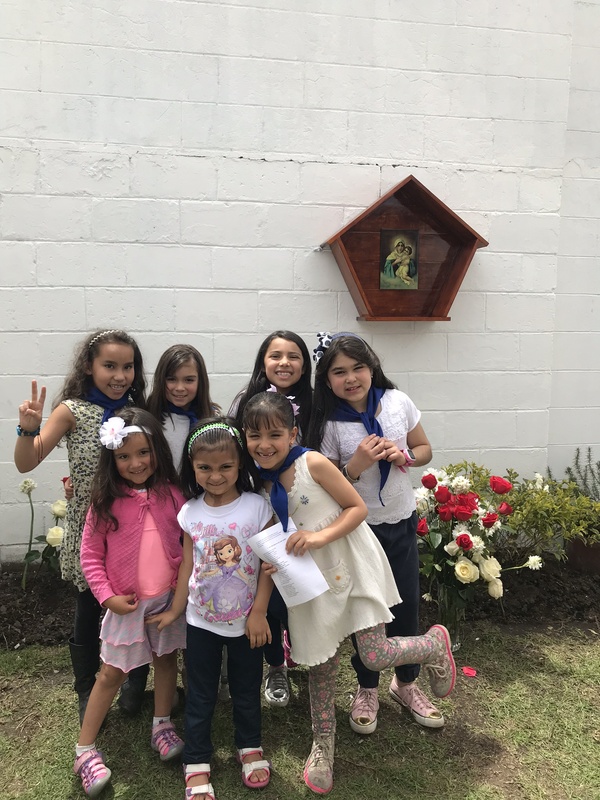 The Girls’ Youth did the readings, guiding the mysteries of the Rosary, and they inaugurated a new choir that accompanied the entire procession. The day began with a radiant sun and the use of umbrellas to help offset the heat as best as possible. Midway through the walk, clouds moved in, and the same umbrellas served to keep them from getting wet from the rain… Ah the weather in Bogotá! Where residents affirm all four seasons can occur in the same day. The procession ended where it began: at the Blessed Mother’s House. The family acquired this house about a year ago, and it has already generated fruits like those from this day. All the participants who attended filled the house’s only large hall, and they celebrated the Holy Mass in together with Fr. 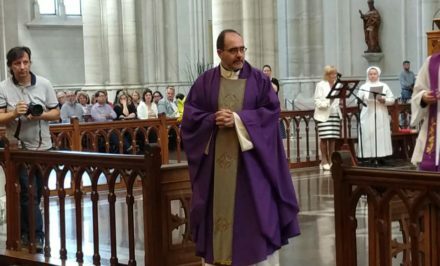 Rubén Darío Franco, the pastor, celebrating. The clouds decided to move on giving way to a shining sun as it accompanied the blessing of the wayside shrine in the garden behind the house. All the participants gathered where the Blessed Mother would be placed. The Little Apostles and younger children carried red and white roses to decorate this new place and make Mary smile. After the blessing, Schoenstatt allies sold food, drinks, and religious products with the goal of raising funds that will allow them to travel to Panama in 2019, for World Youth Day. As always in solidarity, the Family and participants supported their endeavors, and they took advantage of sharing a delicious meat pie and sodas. This was the first activity the Girl’s Youth had led from an idea born of their concerns and which they organized with their own resources. 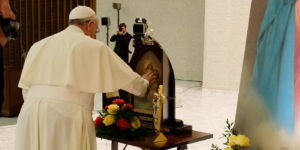 We will maintain this wayside shrine with many contributions to the capital of grace, and we will continue to pray to the Blessed Mother to attract more hearts to give Colombia a Movement that is based on attachments with the desire of reaching heaven.